Choose your Kapost Instance then click Install. When the integration opens in your instance, give it a name and insert your credentials into the appropriate fields. Please note, you must be a Curata user, to take advantage of the Curata / Kapost integration. Go to the Curation tab in the more settings menu. Here you will want to turn on Curation and select the content type you want ideas approved from Curata to come into Kapost as. Hit save, and now you're ready to curate! You can do this by going to the Curation Tab under the More dropdown menu on a content asset. Here you will see all your Curata items. When you hit the approve checkmark, the item will turn into a Kapost asset. You will continue using Curata to filter in the topics and keyword related items that you want, but you can filter it through Kapost to have all your content activity in one platform. 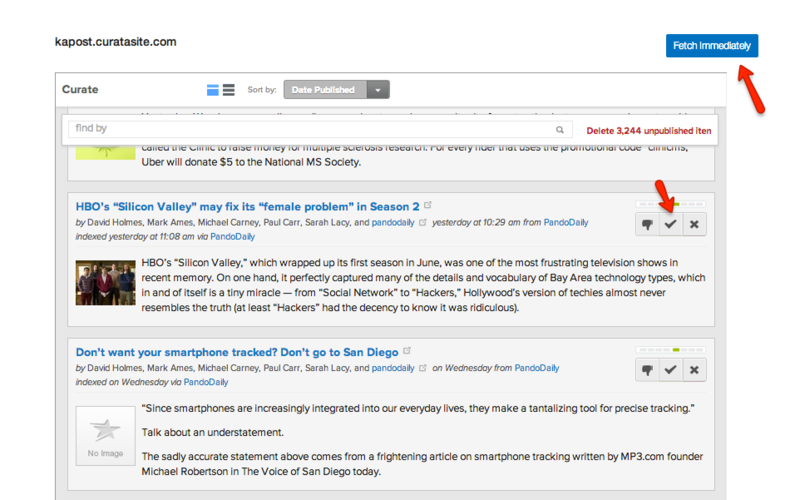 When you approve an article, it will take ~15 minutes for it to appear on the "Ideas" tab in Kapost. You can press "Fetch Immediately" to have the articles appear on the catalog sooner. Please note, due to the way Curata integration works, ideas that come in from Curata will have the first member of your instance listed as the creator.